Yesterday I got to see the Pentax Q in person, at the Outdoor Photo Expo, here in Salt Lake City. I have to say, it's much more striking in person than it is when you just read about it. Since I don't think very many people have seen it yet, I took a ton of pictures and wrote an short article about my impressions. Awesome forum and happy to finally join. The Pentax Q appears to be a nice little pocket camera, but with a small sensor it makes me look at Sony now. I been using my brothers Nikon D90 and have been holding back from getting a Micro Four Thirds Camera cause I thougt those sensors were small vs. the D90 Now, with this new Pentax Q it seems like its going the opposite direction. Maybe that tiny sensor is super efficient and has equal performance to a much bigger counterpart..who knows? Im more confused as to why Pentax did this. Finally - someone commenting on my big scoop! I think we're all wondering why Pentax made the Q - or at least, if it's going to sell. The sensor is the big question. However, after seeing it in person I can say that it's small size is attractive. You can see in the photo here how much smaller the Q is than the Olympus E-P3. 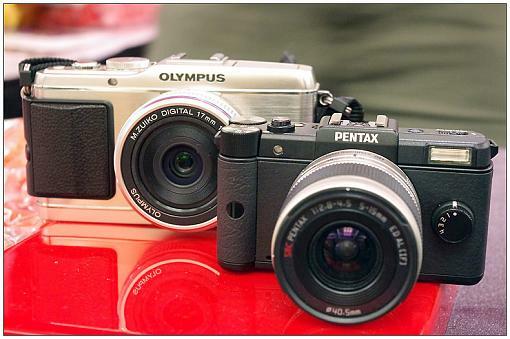 A good review I would like to see is the Pentax Q vs. Fuji X50. The X50 has a 1/2in Sensor, which I beleive is still smaller then traditional 4/3 Micro Cameras at 225mm^2. Ohhh - what do we have here - Pentax Q sample photos! These are on the Japanese Pentax Web site and the highest ISO they're showing is only 200. We'll have to see some independent tests at higher ISO settings before we can really pass judgement. That said, the ISO 200 image does look pretty good. I'm not sure it's competitive with the current Micro Four Thirds cameras, but it looks good. Maybe that tiny sensor is super efficient and has equal performance to a much bigger counterpart. Physical size will forever be a limitation of optics. M43, NEX and Samsung prices are on the fall lately, some even in the $300-$400 price range. I think that trend is compounding the already outrageous asking price of $800 on the Pentax Q. I think they will need to rethink this price point or they will be forced to by lots of unsold inventory. I'd rather have 2 G12's or XZ1's, or one of each. The Q couldn't have any more than a slightly marginal image quality increase over them (if any). Did you ask the Pentax guy exactly what it is you get for the $400 extra they charge? Last edited by Anbesol; 08-26-2011 at 10:15 PM. I got the Q 2 days ago and love its small size. I also have the K5 and am now trying to get used to the tiny Q. The reason I bought it was because I saw how great the photos are from a number of friends who have bought the Q when it was first launched.